Last year’s aggregate sales revenue of Korea’s content industry was 94.3 trillion won (US$87.4 billion), up 3.4 percent from the previous year. The industry-wide exports were $5.41 billion, 9.8 percent higher than that in 2013. The industry set this year’s target at 98.9 trillion won (up 4.9%) and $5.84 billion, respectively, for sales and export volume. The Korea Creative Content Agency will hold a forum on January 19 at the COEX Conference Hall in Seoul’s Gangnam and present the industry’s performance in 2014 and the outlook for 2015 including these figures. The sales revenue in the game segment rose 7.4 percent to 10.4 trillion won while exports growing 12.2 percent to $3.05 billion. The segment’s growth was buoyed by the rapid increase in the mobile game market, with competition getting fiercer as several large-scale foreign game developers and publishers moved in to the domestic market. The sales in the character business were 870 billion won, up 4.6 percent from 2013 while the exports growing 10.8 percent to $490 million. For full article, see Korea Economic Daily. The Korean government plans to spend 180 billion won ($163 million) over the next five years to support game developers who have been facing a double whammy of intensifying competition in the global market and tough regulations, and negative perceptions at home. The five-year road map for the development of the game industry, unveiled Thursday by the Ministry of Culture, Sports and Tourism, envisions efforts to bring about a fundamental change to how the public and policymakers perceive online games. A negative perception of online games is at the center of a vicious circle that has trapped the industry in a skills crunch, a decline in the number of hit products, and slowing growth, the ministry said. “There are many social misconceptions about games, particularly on the side of parents and teachers,” said Yoon Tae-yong, a director at the Culture Ministry, at a news conference. The ministry plans to roll out what it calls the “game literacy” program in cooperation with related government bodies to help parents and teachers forge a more balanced view of games, he said. Nine of the Google Play Store’s top 10 highest-grossing apps are Kakao games. The other one is the KakaoTalk messenger app, so it is fair to say that the “Kakao Kingdom” reigns supreme. National mobile games that rake in several billions within a year of release have emerged one after another since Kakao (the provider of global mobile social platform and mobile messenger KakaoTalk) launched Kakao Game at the end of July of last year. Over the past year, the Kakao game platform has spearheaded growth of the entire mobile game industry. Accumulated sales from Kakao games amounted to KRW 466.2 billion over the past year with KRW 348 billion in the first half of this year, up 194% from KRW 118.2 billion in the second half of last year. Kakao Game’s KRW 466.2 billion in sales over the past year even exceeded the domestic mobile game market’s 2011 total sales. According to KOCCA (Korea Culture and Content Agency), the domestic mobile game market is projected to hit KRW 918 billion this year and KRW 1.26 trillion next year (more than a 3-fold increase from KRW 316.7 billion in 2010 when South Korea’s smartphone penetration started to take off. As part of efforts to build the so-called creative economy backed by the Park Geun-hye administration, the government said yesterday it will expand the volume of Korea’s content industry to 120 trillion won ($105 billion) annually by 2017, up from 88 trillion won last year. Yoo made his remarks at a joint press briefing in Yeouido, western Seoul, with the future planning ministry and the finance and strategy ministry on boosting Korea’s service industry. Part of the briefing was dedicated to announcing plans on developing the content industry that includes music, games, movies and animation. People will be able to enjoy games on their handsets at any time of the day as the government decided not to include mobile games on the list of those prohibited from play from midnight to 6 a.m. The Ministry of Culture, Sports and Tourism and the Ministry of Gender Equality and Family announced Monday that they would exempt mobile games from applying the online game curfew. According to the notification, online games for personal computers, Web-based games and PC package games are currently subject to the online game curfew banning children under age 16 from accessing them during the first six hours of the day. The new law will take effect from May 20-May 19, 2015 following an advance notice period running until Feb. 13. The government wants local game companies to make it harder for teenagers to become addicted to online games. The Fair Trade Commission yesterday ordered local game service providers to change rules involving young players. Underage plays will not be able to sign up for an online game account without permission from a legal guardian. Also, an adult’s permission will be required when an underage gamer wants to purchase a game item on a Web site. Any transaction made without the consent of an adult can be automatically cancelled. The number of consumer complaints about underage gamers has risen in recent years. 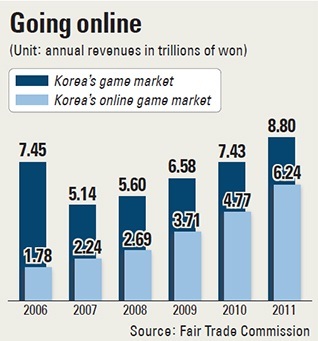 Revenues for the local online game market increased from 5.7 trillion won ($5.4 billion) in 2010 to 6.2 trillion won in 2011. 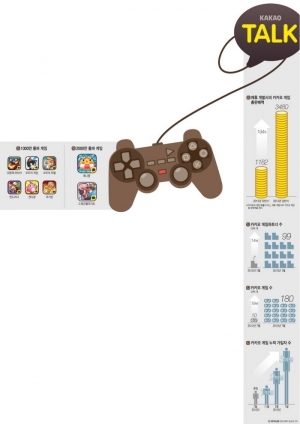 The online game market accounts for 70.8 percent of the entire game industry, which had 8.8 trillion won in sales in 2011. The number of consumer complaints filed to game companies rose from 4,285 in 2011 to 5,593 in 2012. The Korea Serious Game Festival (http://www.ksf2011.co.kr/exhibit_en/) will be held for the third time from August 31 ~ September 2, 2012 at the Seongnam City Hall, just South of Seoul. Ten Dutch organzations (companies, R&D institutes and universities) will visit Korea to attend this event to look for business partners. On August 31 (Fri), the Dutch companies will be available for B2B meetings at the festival. If you are interested to meet one or more Dutch companies, please register at: http://bit.ly/SeriousGamesMatchmaking. After registration, you will be contacted to set up a time for the meeting on August 31. Mobile carrier LG Uplus unveiled its cloud computing based game platform called C-games, Wednesday. 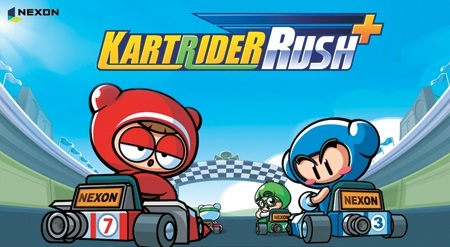 Subscribers of various network services can purchase games from the C-games website that can then be played on any device with Web connectivity. Korea has decided to ban trade for commercial game items from the second half of this year as a measure aimed at encouraging students to not waste time. The Ministry of Culture, Sports and Tourism has announced that it is planning to halt all virtual item trades with a new law, to be announced sometime next month. “The main purpose of the games is for entertainment and should be used for academic and other good purposes,” said Kim Kap-soo, head of the ministry’s content policy division, Wednesday. The government official also stressed item collecting for commercial use is a serious hindrance to creating a healthy game culture. Korea is the world’s most-wired society with the Internet penetration rate standing at above 93 percent, data from government agencies said. Korea is also the home of the world’s biggest smartphone and TV manufacturer _ Samsung. For online role-playing games, the law prohibits users from using programs that allow in-game characters to hunt and collect items without the need of a player controlling them.